These are the most rare of American Indian records in my collection being live field recordings dating back between 1920 and 1930 evidenced by wording on these records and other telltale signals of age. You will note an extra hole next to the centered spindle hole. This extra hole in each record is to accomodate an antique "record cutting" machine. This extra hole serves as a drive pin hole for spinning a record while cutting sound grooves into a vinyl record. Having drive pin holes, directly indicates these are original recordings, not duplicates for public distribution. Quite possible these are the only recordings in existence. These recordings are the first playing of these records. When I bought these records, both were lightly stuck together appearing to be a single record. The antique dealer sold these records to me as a single record not knowing what appeared to be a single record was actually two records stuck together. Upon gently splitting these records apart, I discovered the stuck together sides did not display fingerprints, dust nor other signs of usage. What a discovery! These records are over seventy years old and never before played! 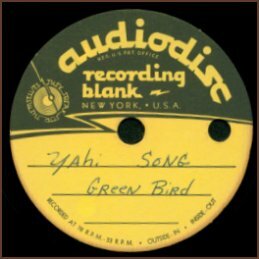 An Audiotronics 300 tube type record player was used to play these rare 10 inch 78 rpm "Audiodisc Recording Blank" records. This record player is over fifty years old and these records, over seventy years old! What you will hear are live field recordings, most likely recorded by an anthropologist or similar field of study. Recordings are of the Navajo tribe, the Commanche tribe and the extinct Yahi tribe. The story of the Yahi tribe is so tragic and so typical. As with all American Indian tribes, the Yahi were subjected to four centuries of genocide efforts by Anglos, this is, your ancestors, if you are white. Sadly, all Yahi were slaughtered save for one, Ishi. 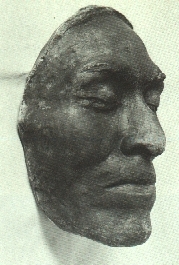 He was the last member of the Yahi tribe and died in 1908. Here is a link to a wonderful yet sad story of Ishi, his Yahi tribe and a story of "White Man's" murderous slaughter of his tribe and his immediate family. Yahi are, or were a tribal clan of the Yana, with both tribes being members of the Hokan peoples here in California. Please do read, I urge you to read the story of Ishi. This will help to remind you of how tens of millions of my ancestors, my family of peoples, were slaughtered by "Hatak Tohbi" - White Man.